everyone else’s control — I call that God’s business. Much of our stress comes from mentally living out of our own business. When I think, “You need to get a job, I want you to be happy, you should be on time, you need to take better care of yourself,” I am in your business. When I’m worried about earthquakes, floods, war, or when I will die, I am in God’s business. If I am mentally in your business or in God’s business, the effect is separation. I noticed this early in 1986. When I mentally went into my mother’s business, for example, with a thought like “My mother should understand me,” I immediately experienced a feeling of loneliness. And I realized that every time in my life that I had felt hurt or lonely, I had been in someone else’s business. If you are living your life and I am mentally living your life, who is here living mine? We’re both over there. Being mentally in your business keeps me from being present in my own. I am separate from myself, wondering why my life doesn’t work.To think that I know what’s best for anyone else is to be out of my business. Even in the name of love, it is pure arrogance, and the result is tension, anxiety, and fear. Do I know what’s right for me? That is my only business. Let me work with that before I try to solve your problems for you. If you understand the three kinds of business enough to stay in your own business, it could free your life in a way that you can’t even imagine. The next time you’re feeling stress or discomfort, ask yourself whose business you’re in mentally, and you may burst out laughing! That question can bring you back to yourself. And you may come to see that you’ve never really been present, that you’ve been mentally living in other people’s business all your life. Just to notice that you’re in someone else’s business can bring you back to your own wonderful self. And if you practice it for a while, you may come to see that you don’t have any business either and that your life runs perfectly well on its own. It was 9:30am on a Wednesday. And I was sitting in a bathroom stall in an office building in Ottawa writing Communist slogans on the toilet paper. Don’t get me wrong, I wasn’t a Communist by any possible stretch of the imagination. I was doing this in an effort to stay sane. Working as a temp in a government office where not a single person bothered to learn my name was starting to get me down, and drastic measures were called for. And so each morning on my break I stuck a felt tipped marker in my back pocket and went to the toilet. I rolled down the paper and wrote things like “Power to the People!” or “The Party is Always Right”. And then I rolled it back up again. I spent the rest of my mornings unfastening endless piles of research grant applications and putting them into a different order, because the applicants hadn’t followed the directions. I was grateful for the money, of course. But it was mind numbingly boring. Whenever I began to feel my soul draining out of me, I pictured some guy in the bathroom peeling off a strip of toilet paper and finding one of those slogans. His first reaction was likely to be, “What the…. ?” quickly followed by, “Why…?” And then hopefully he’d start laughing like he hadn’t laughed in years. I wanted to bring a little sunshine into that otherwise grey world. I hated that job. I hated every job I ever had. I woke up swearing every morning. I swore in the shower and I muttered profanity under my breath all the way to work. I felt useless because the work I was doing had no meaning. I wasn’t drawing on my talents. I wasn’t making the world a better place. And I felt trapped because the pay I earned was barely enough to live on, and I didn’t have any savings. I wanted to write, and I knew my words would add value to other people’s lives. But I couldn’t see a way to make enough money to survive at it. I finally reached a point where that didn’t matter anymore. I couldn’t imagine a more miserable life than the one I was already in. And so I vowed to make a living by doing what I loved — or starve to death trying. And I meant it in every fiber of my being. When the contract ended, I asked the temp agency to remove my name from their list. And that was the last actual “job” I ever had. Since then I’ve met an awful lot of people who feel trapped by the miserable circumstances of their lives. They’re completely unhappy. But when I ask them why they don’t change, they say they’re afraid to take the first step. You don’t need courage to take that first step. You just need to focus on two things: hate and desperation. You already know that I hated my old job so much that even the worst failure was better than going back to that office. But where does “desperation” come in? Fast forward to a couple years later. I was earning a little money from my writing, but we were still living on my wife’s salary as a translator in the automotive industry. Payment for freelance work was irregular at best, and I needed money to pay some bills. Badly. By the middle of next week. And I had no idea how I was going to get it. I had no one to borrow from. I didn’t have a job. And I wasn’t expecting checks from any magazine publishers either — not that you can ever count on “Check’s in the mail” from them! What did I do? I drew on everything I learned in my 20+ years of martial arts training. It was the only other thing I could consider myself a legitimate “expert” in. I drove over to Future Shop and bought a mini-DV video camera and some editing software with my credit card. Then I sat down with a paper and pencil and wrote a list of every crazy push up variation I could think of. I got on the floor and made up a bunch of new ones too. I ended up filming several more of those downloadable tutorials in the following months. One on ab exercise variations, one on ankle strength, and one on mobility drills using a stick. My audience loved them. Each one sold better than the previous installment, and always for $10. But I didn’t raise the price. I over delivered and built loyalty and trust with my audience instead. And six months later, I coauthored a larger online product with a friend. We called it Bodyweight Exercise Revolution and it made $10,000 in its first month. Fast forward again — this time by 3 or 4 years. That coauthored program evolved into a business partnership. Adam Steer and I created and sold many more online fitness programs through a site called BodyweightCoach.com. And today we’ve got a seven figure business called Shapeshifter Media, where we help other new authors publish their work in the online fitness niche. 1) Hate: you have to hate where you are right now so much that staying the same is far worse than the discomfort it’ll take you to change. 2) Desperation: sometimes you have to back yourself into a corner so you’re forced to come up with creative solutions. I hated my job so much that staying there was worse than the risk of trying to live my dream and starving to death. And I needed that moment of desperation — having bills to pay but no money to pay them with — to free up my imagination so it could find a creative solution. But thankfully you don’t have to do anything dumb to get that desperation. There’s no need to go into massive debt, or poke a lion with a stick. It can be something as simple as setting a really tight deadline. Or buying a one-way ticket to a place you’re scared to travel. Try it today. Rig the game in your favor and commit to your goal in public. You’ll be amazed at the creative solutions you come up with. And don’t sweat it too much if you hate your current circumstances with the fiery passion of a thousand suns. I hated mine too. Transform that energy into positive momentum instead. Tell us what first step you are ready to take. Is your business listed here? Maybe you can learn a little what you can do to make it better? · FYI Only – I‘ve read a few of Michael Gerber’s books and had friends tell me some of the above are good. Some things you may even already know, but good refreshers… Good luck. When you’re with a group of people, how do you want to feel? 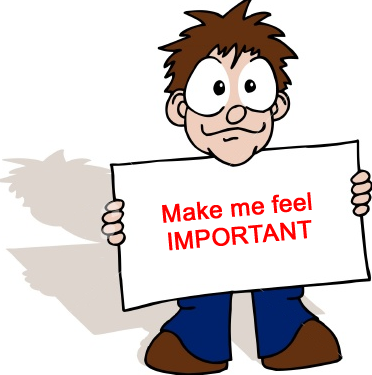 Think about it….whether it is at work or socially…..
….in most cases people want to feel important (among other things)! When someone in your past has treated you as an important person, or someone listens to you and your thoughts, or you’re a client and they treat you like a VIP – you feel important and that feels good. Maybe you have a friend, a teacher, a mentor – someone that truly thinks you are important and they treat you that way. You feel pretty good right? You feel like you’re special, like you can do things and you have more confidence. Do you make or let others feel important? I know a gentleman, I don’t get a chance to see him much anymore, but he always made me feel special. He listened to me and I could tell he valued what I said. I know that he was much smarter than I was and I probably didn’t have much new to say or much to add to his knowledge on things, but he never acted that way. I had the chance to see him out in public somewhere – a group of us had to go to the supermarket to buy food for an activity. It was amazing, he asked a clerk where something was and he made that clerk feel special! The guy left smiling and had a spring in his step! Later at the cashier, he made her feel special, too! She smiled to herself and looked happy doing her job. I wish I noticed more what he said – it wasn’t much….it was a few passing words, a smile, a question or two perhaps – but the ‘special’ part was no more than 2 minutes – probably 1 minute. Some people are born with the gift, like he was, but we all can develop it. Think of ways that you can make others feel special each day. At work – your boss, co-workers, your clients, your support team, etc. It doesn’t matter what your job or career is – whether you’re in sales, teaching, medicine, art – making others feel important will help you and help them – and help you accomplish your mission – whatever that is. How can I make others feel important each day? What things can I say or to make others feel important? What makes me feel important? Why do I feel important?